American based car maker Ford is all set to commence a major sales boost to the company by launching the new Ford Figo Aspire tomorrow. The Figo Aspire would launch tomorrow (August 11 2015) and shall compete in the busy and fast-selling compact Sedan segment. Ford Figo Aspire is going to take on rivals like Maruti Suzuki Dzire, Honda Amaze, Hyundai Xcent and Tata Zest which are the top contenders in this segment. As the name suggests, Ford Figo Aspire would be the sedan version of the next-generation Figo which is due from quite a long time. 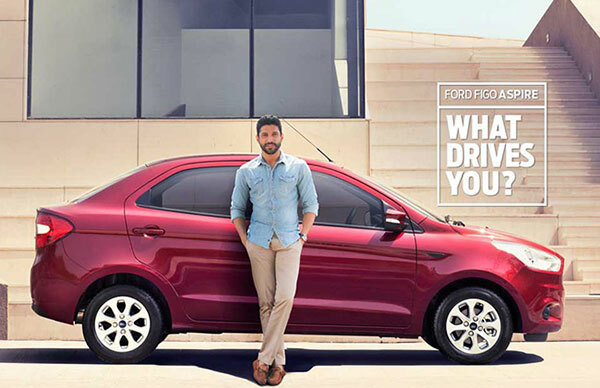 Ford Figo Aspire is one of the best proportioned and designed cars going by the standards of this segment. Key design of Aspire include bold chrome lined Aston Martin like grille as well as the prominent bonnet and waist line. The car’s rear ends in a typically stubby but layered boot and bumper. The Ford Figo Aspire is expected to come quite heavily loaded with features. Other than offering the standard Bluetooth telephony which is integrated with infotainment system and steering mounted phone and audio controls, the car shall come with automatic climate control as well as height adjustable seats. All the versions of Ford Figo Aspire shall come with standard ABS and 2 airbags. The top of the line Ford Figo Aspire on the other hand shall come with a staggering six airbags. Refer safety features of Ford Figo Aspire to get more details. Ford is going to offer the Ford Figo Aspire with a choice of 3 engines and 2 gearboxes. The petrol unit is a 1.2-litre Ti-VCT engine that delivers a maximum power of 88PS and a peak torque of 112Nm. The diesel engine of Ford Figo Aspire is 1.5-litre unit which incidentally powers Ford Fiesta and Ford EcoSport. The engine develops 100PS of power and 215Nm of max torque, about 10PS more than that of Fiesta and Ford EcoSport. Both the engines comes mated with a 5-speed manual gearboxes. There is also a six-speed dual clutch automatic which is in the offering. The gearbox would be mated to a stronger 1.5-litre petrol developing 110PS power and 136Nm torque. The Ford Figo Aspire price is expected to be offered in the price Rs. 5 lakh – Rs. 5.7 lakh (ex-showroom).